Green pig? Sure, why not! I haven't yet spoken out about what Presidential candidate I support. That's partly because I'm still deciding, doing research and some serious contemplation, and partly because I want very much to avoid the unprecedented toxicity this election year has brought with it. But while I'm still not totally decided yet who I'm voting for President, I've finally decided to humbly voice a few of my opinions. I'm fairly confident I will be voting third party. Many supporters of Trump and Clinton have been quick to mock, insult, and even shame those who support a third party candidate, claiming that by so voting they are giving their vote to the other side. There have also been many a well worded explanation for why that logic is false. The reason that stands out most to me is that the results of each election do not just affect who will be President for the next four years. The effects are more far-reaching than that. If there is one common complaint about modern American politics, it's that it is so polarized. The left and the right are so extreme that it's actually ridiculous. I think most Americans don't agree with the extreme positions taken by the party they support, but they feel they have no choice so they adopt a platform they don't feel comfortable with out of fear of an even worse platform. However, doing so shows support for the current system. Think of it this way: if the election turns out to be split 49% vs 51%, regardless of who actually wins, that is enough to show both parties that their party supports their position. So for the next election, they are likely to not only maintain their position, but push it even further to an extreme to gain even more support. If on the other hand a significant portion of voters shows dissatisfaction by not voting for either of the two main parties, think of the message that would send. If for example the election results were split 40%, 41%, 19%, even though a major party still may have won the election, they may seriously consider what they can do to win over that other 19%. After all, if they could gain their support, that would be enough to win the next election by a much more comfortable margin. How would they win over that 19%? By finding out what it is they want. And if what they want is a more moderate platform, they might, might just back down a bit from their political extremism. 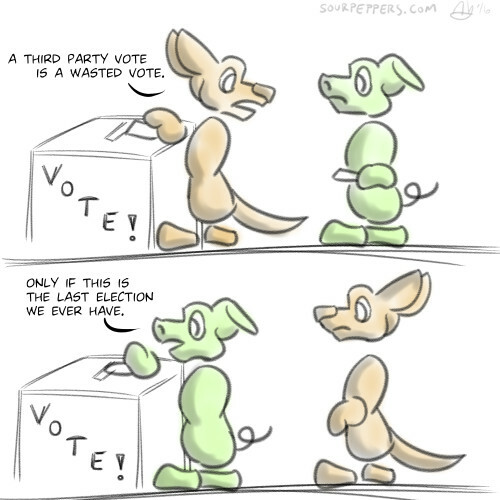 So even if a third party vote has very little chance of getting that third party candidate elected, it can still affect political discourse for the next four years and even the following election. Call me naive, but I think a person's reasons for voting the way they do are way more important than who they actually vote for. Why? Because if a person votes for a candidate because they believe they are the best choice and then later finds out that isn't the case, they are likely to vote differently and more carefully in the future. On the other hand, if they vote for a candidate out of blind party loyalty or even selfishness for something that candidate has promised, they are likely to stick to their guns regardless of what may actually be best for the country. Making sure you're voting for the "right reasons" requires being honest with oneself. It requires asking "why do I want to vote for this candidate? Do I really believe voting this way is what is best for my country?" I would challenge everyone to ask themselves these questions, and then to do their civic duty and vote. Because the only truly "wasted vote" is the one you don't cast. I like how you weren't quick to judge what the right reasons are. You gave several scenarios for voting one's conscience and even put an etcetera.